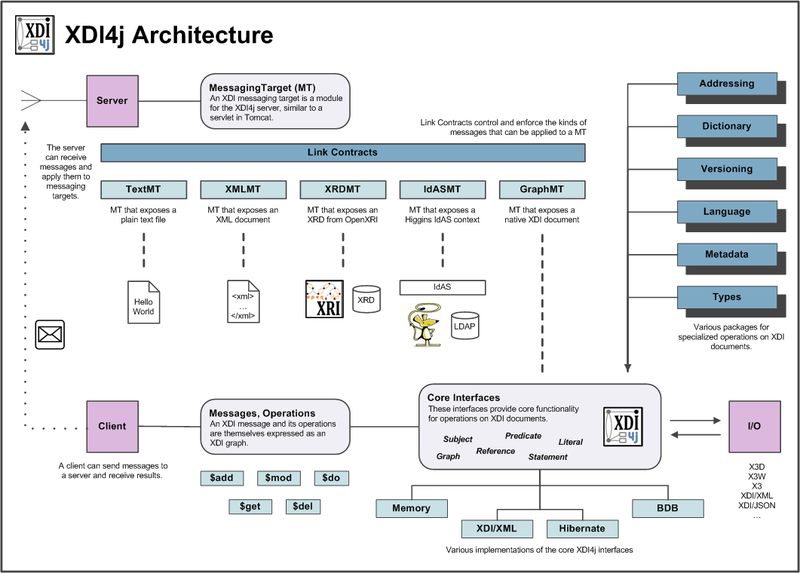 XDI ("XRI Data Interchange") is a data model and protocol for sharing, linking, and synchronizing data over the Internet ("structured web") and other networks using XML documents and Extensible Resource Identifiers (XRIs). It is being developed by the OASIS XDI Technical Committee. XDI4j 1.1 is a general-purpose Java library that implements XDI. It also includes a server component for running XDI endpoints. The Higgins XDI Context Provider. XDI4j is a component for use by other components and applications. It is not used by end-users directly. See XDI4j Tutorials for some examples of how to use the XDI4j library. See XDI4j Endpoints for a list of sample XDI endpoints that can be talked to via XDI Messaging. Because of Eclipse restrictions some of the XDI4j third party dependencies cannot be checked into the SVN. These dependencies have to be manually downloaded installed into the lib/ subdirectory after checking out the sources. Some parts of XDI4j can be used from within C and C++. In order to do so, the library needs to be compiled with GCJ. The org.eclipse.higgins.xdi4j project contains a Makefile for the GNU Make utility which can be used to create C++ header files and object files for linking C++ applications with XDI4j. The project also includes a C++ sample application which sends an XDI message to an endpoint. This page was last modified 09:15, 24 August 2010 by Markus Sabadello. Based on work by Paul Trevithick, Anna Gorb and Tom Carroll.